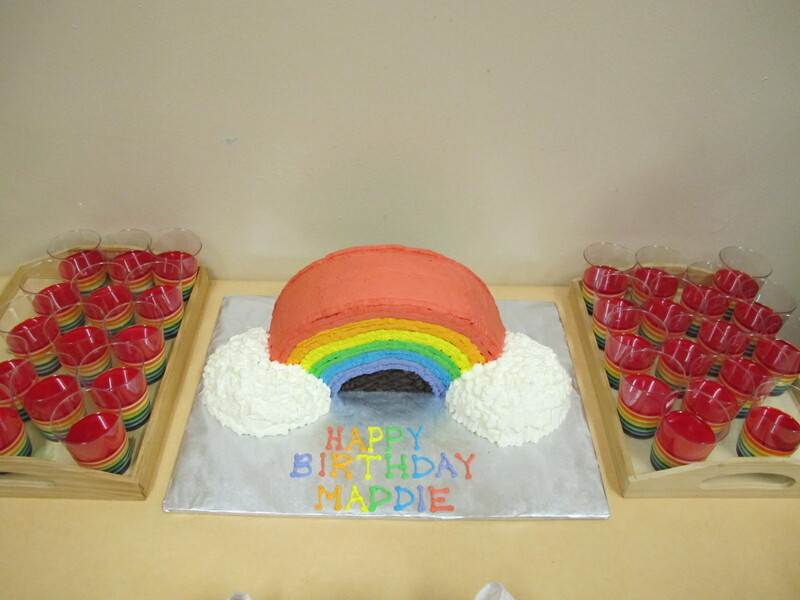 My daughter loves rainbows, so for her 5th birthday party, it was not a surprise that she asked for a rainbow cake. I happily obliged as she is my dearest, little rainbow. As I planned for the party I quickly became rainbow crazy. From party favors, to fruit trays, to invitations, and so on, I had rainbows upon rainbows of ideas. For the cake itself, it was not hard at all. I used a 15″ round cake pan to bake her favorite chocolate cake. I cut the cake in half to form semi-circles, glued the two halves with frosting, and then stood the cake up on the flat side. Since it seemed like we would have a lot of guests, I also made two hemispheres using my ball pan mold (can you guess why?). I cut out a quarter slice from the two hemispheres and then placed them on the ends of the rainbows to make clouds. I used whipped cream for the frosting and tinted them in the 6 rainbow colors and reserved some for the puffy, white clouds. Using a flat tipped piping tip, I pipped the rainbow colors over the cake. I plopped the white whipped cream over the hemisphere ends to give them a “fluffy” look. Here are all the crazy rainbow party ideas I had. 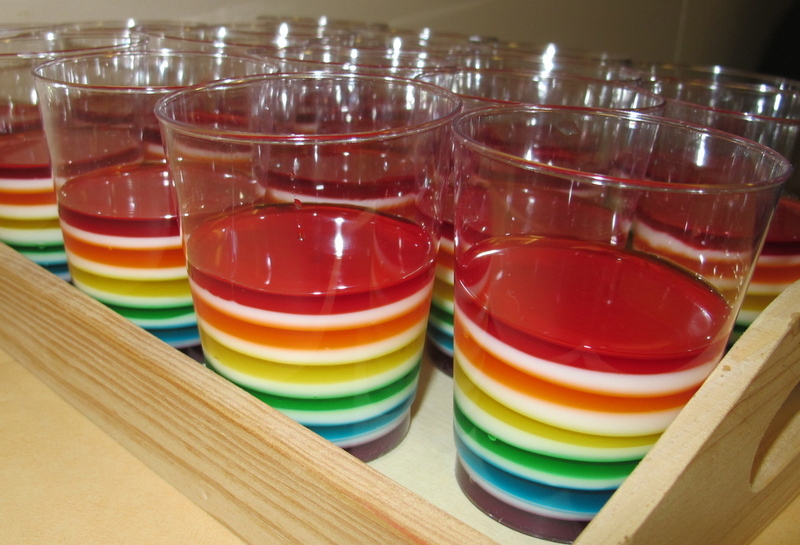 This first one is rainbow jello. You will need plenty of space in the refrigerator for this, believe you me. I made a package of purple jello (not the extra large packet size) and put about 1-2 tablespoons of the jello in a clear plastic cup. Be careful not to splash the sides of the cup or the layers won’t turn out as crisp. If you do, which I did, of course, just take a paper towel and wipe before setting in the fridge. Because the layers are so thin, they set very quickly, so even though it was time intensive, it really wasn’t too bad. To make the layers really stand out, I used white jello in between each color. I had never made white jello before so searched the internet for some ideas. There were two recipes I found, one using sour cream and the other using condensed milk. I opted for the condensed milk because I love this stuff! I know I shouldn’t admit it but we all have our weaknesses…and I figure sharing one of many, many that I have is probably okay. 1. Dissolve 2 envelopes of Knox unflavored gelatin in 1/2 cup of cold water. Let stand a few minutes until thick, then add 1/2 cup of boiling water. 2. Mix 1 can of sweetened condensed milk with 1 cup of boiling water. 3. Combine the milk mixture w/ the dissolved gelatin mixture. Cool to room temperature. Make sure the milk mixture is cool and not hot or it will dissolve the colored jello layers and mix the colors. You will need to warm the batch of milk mixture every so often if it starts to set while the other layers in the cups are setting in the fridge. Pour 1-2 Tablespoons of the milk mixture over the purple Jello and then set in the fridge. Dissolve the blue jello and repeat from above. Here’s a close up of all that work. If you have the time, do it as “oohs” and “ahhs” from kids are worth it. 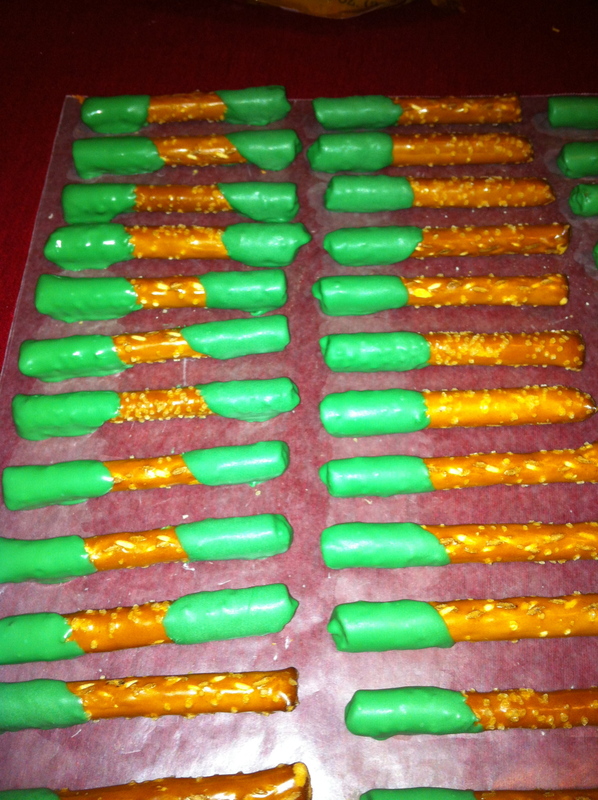 Using pretzel rods and melted chocolate, I made some pretzel crayons. I took a pretzel rod, cut it in half, then dipped both ends in melted colored chocolate. To cut the pretzels, use a serrated knife so they don’t break into shards. I had to backward calculate how many total pretzel rods to use based on how many favors I needed, multiplied by the number different colors per set (in this case 6), and then divided by 2 (since I cut them in half). Dip only the ends as you see below, letting the chocolate set on waxed paper. The kids had a lot of fun helping me with this. To make the wrappers, I used MS PowerPoint only because I did not have my Mac set up to work w/ our old printer. I would have used Keynote otherwise. I just used the circle shape and pulled it out into an oblong. I then typed the color inside the oblong and made many copies. I got the cellophane bags from Michaels. 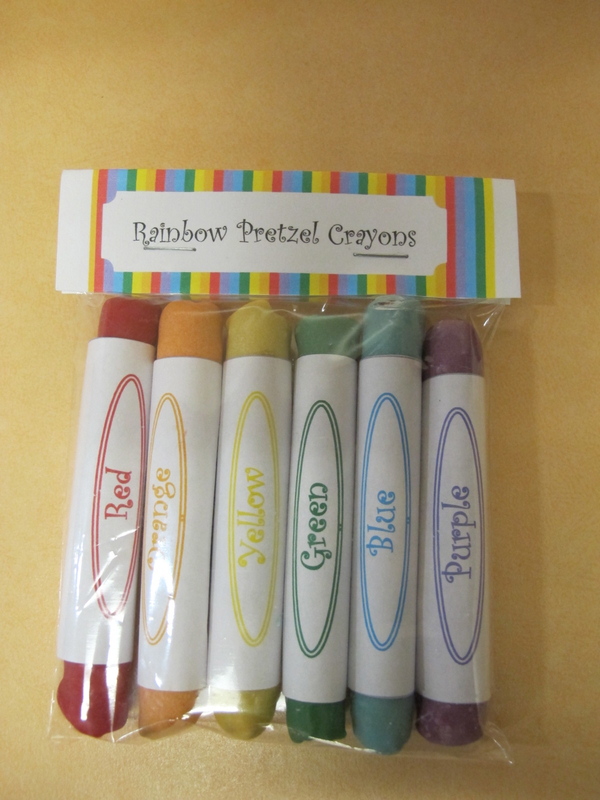 They were long, so I had to shorten them to fit the length of the pretzel crayons. I also made the tags and used staples to seal the package. I had to send an email to the parents after the party when one parent commented that her daughter loved using the crayons! Most thought they were actual crayons and were delightfully surprised when they realized they were tasty treats. 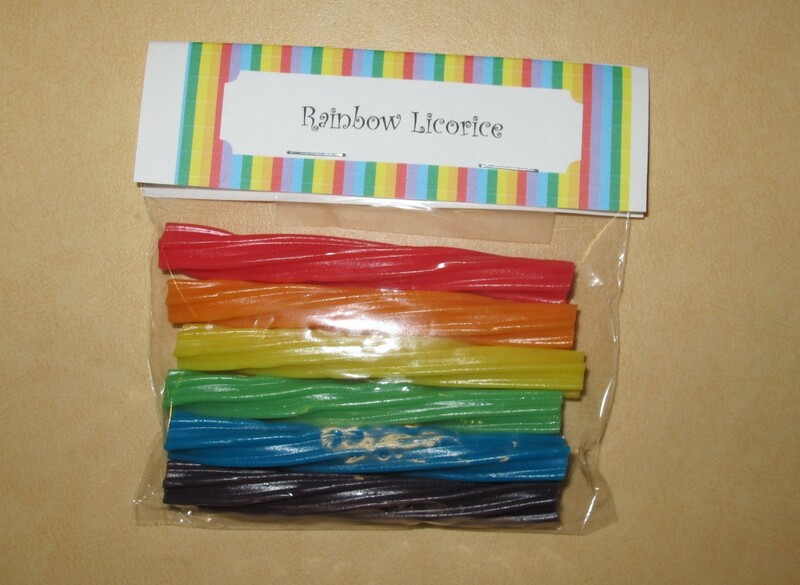 I also bought rainbow twizzlers to make a rainbow licorice treat. I think I ended up cutting each licorice strip into 3 pieces. 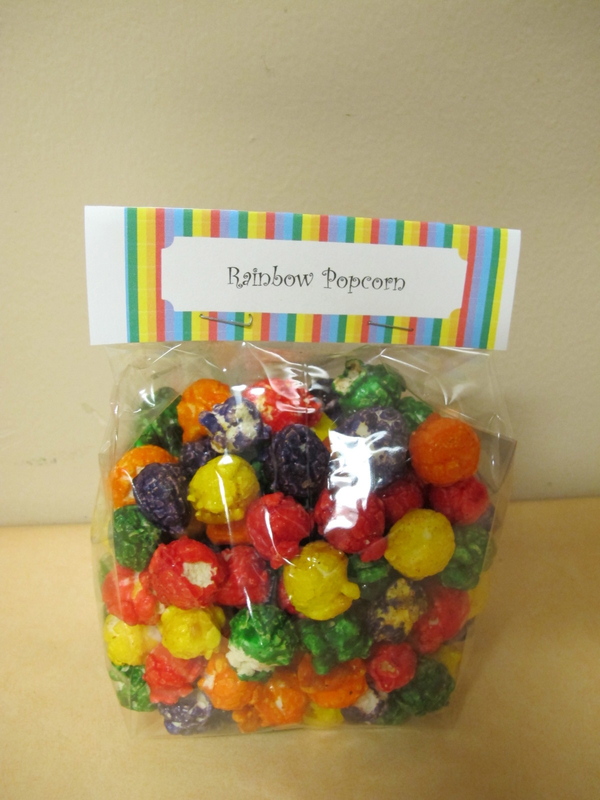 I was also able to find an online store that sells fruit flavored rainbow colored popcorn – Rainbow Popcorn – Popcorn Palace. I think I ended up ordering two 3.5 Gallon tins which made more than enough packages for 30 guests. I was also able to get rainbow pinwheels from Cost Plus (I got lucky they were in stock! I bought them all out! 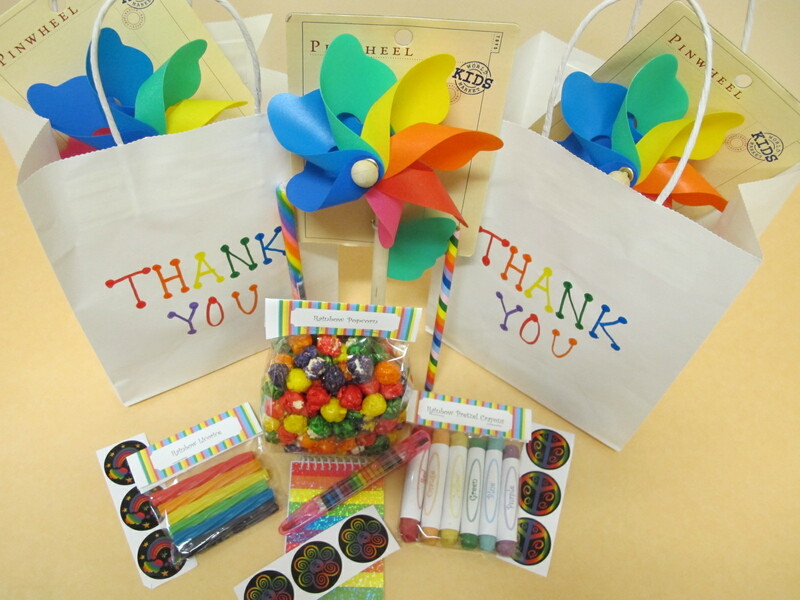 ), rainbow pencils, stickers, notepads from Oriental Trading, and white favor bags from Michaels where I wrote “Thank You” in rainbow colors.